The US secretary of state has condemned an attack on US ambassador Robert Ford after he was pelted with eggs by Syrian president supporters in Damascus. Hillary Clinton said it was "wholly unjustified" and urged Syria to protect diplomatic staff. Eggs and tomatoes were hurled at Mr Ford as he met an opposition figure. Veteran politician Hassan Abdul Azim said about 100 protesters tried to get into his office as Mr Ford arrived and then surrounded it, trapping them both. 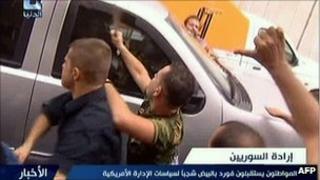 US officials said the mob was violent and seriously damaged embassy vehicles, but that Mr Ford was unharmed. Ms Clinton said the attack was "unwarranted" and condemned it "in the strongest possible terms". She praised Mr Ford's "admirable courage" as a "vital advocate for the legitimate aspirations" of the Syrian people. She encouraged the US Senate to confirm Mr Ford - who was named ambassador last year during recess to avoid Republican opposition - so he could "continue his critical and courageous work". Mr Ford has angered Damascus in the past, notably by visiting the central city of Hama with his French counterpart in July. Media captionHillary Clinton: "We condemn this unwarranted attack"
It led to both the French and US embassies coming under attack from supporters of the Assad regime. Mr Abdul Azim, who heads the outlawed Arab Socialist Democratic Union party, said the ambassador's arrival at his office on Thursday led to a demonstration. "They were protesting in the street and at the entrance to the building. They tried to break down the door of my office, but didn't succeed," he told AFP news agency. "As soon as the ambassador came in at around 11:00 (08:00 GMT) we heard a noise outside and hostile slogans being chanted. The demonstrators tried to attack the office." Syria is under international pressure to stop using force to suppress protests that began six months ago. The UN estimates that more than 2,700 people have been killed across Syria since the crackdown began. The government says it is in the process of introducing reforms and is speaking to members of the opposition - it blames the unrest on armed gangs.